The two-factor authentication is a security process in which the user provides two means of identification, one of which is typically a normal user credential and the other of which is typically something memorized, such as a security code. You can enable Two-factor authentication for users by adding Two-Factor Authentication for User Interface Logins” permission through a Profile or a Permission Sets. Warren Mason is working as System administrator at Universal Containers(UC). He has received a requirement from higher management, they want to implement Two-factor authentication for Partner Community users. Now create one Formula Data Type Number to Generate Random Number. 12 ) Save the flow with name Two Factor Authentication then Activate it and close the canvas. To add restriction on number of unsuccessful attempt, We can add one subflow (It will Freeze user’s account after three unsuccessful attempt). we have created two factor authentication on our org but it is not working on IE11. It works with all other browsers but not IE11. 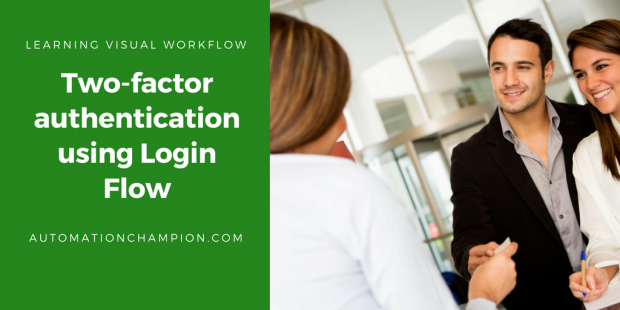 Our Two Factor Authentication using login flow is also not working with IE11,So can you please suggest how to resolve this issue? Pingback: Unconventional application of Two factor Authentication! Appreciate your quick efforts and response. However, this issue is in my dev org and salesforce does not support developer org related issues. And i mistakenly implemented that login flow for System Admin Profile. Is there any work around to get this fixed. It would be a savior for me. Sorry, there is not a workaround for this that I am aware of. You can always raise a case from paid org (to unlock your developer org) or reach out to Salesforce support on Twitter. I have stuck myself into an issue here. I created the flow and it worked all fine. But when i deactivated the flow , now it does not allow me to login into my dev org and every time it gives me the same error.”No active version of the flow exist. Please contact your System Admin”. Sorry to hear about it. The one and the only solution are to open a case with Salesforce.com support or reach out to your Salesforce org administrator. We are trying to implement this solution but get an error message when looking up a record that is not created yet. Did you encounter the same error? If so, how did you solve it? Yes using third party tools as you mentioned above. When I implemented the above flow in my sandbox Org, its working. But when the flow steps completed, it redirect to home page and an error message “Invalid Page redirection” is showing. Could you please help me to solve this issue?